Spencer Haacke shook with excitement as he opened the door to the future office site of the Presentation Practice Center in the David O. Mckay Library. It was the next step in a vision he had for the tutoring center at BYU-Idaho. This new office has been a goal of Haacke’s since the beginning of his position at BYU-I. While the Presentation Practice Center primarily has public speaking students attend, all students are welcome. “I want people to come here to really solidify their presentations, whatever it may be,” he said. The PPC currently has 14 student employees that Haacke supervises. Each employee has taken public speaking or professional presentation classes from Haacke and other communication teachers. The frequent visitors are Haacke’s students and students from other classes requiring a presentation. 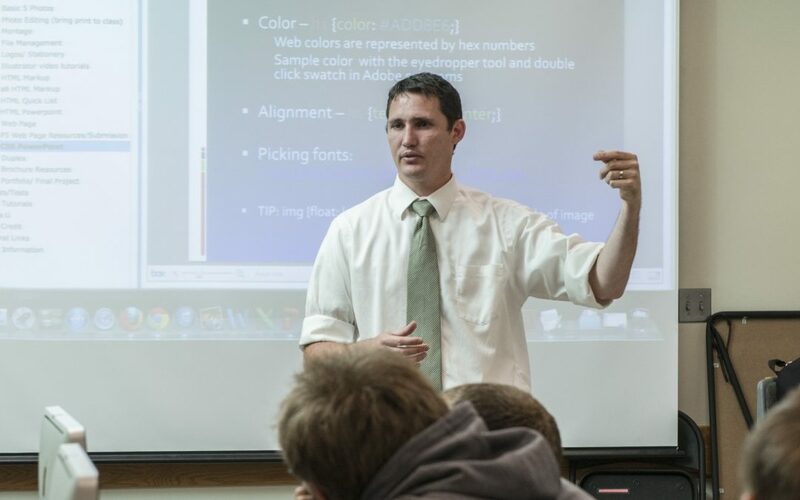 Alongside his duties as director of the PPC, Haacke also teaches Professional Presentations and the Study and Life Skills class for first-year students. The class is designed to help students succeed and thrive in their college and life experience. “It’s a cool class because it’s very applicable to where everyone can grow and do better,” Haacke said. The involvement led him to work as the campaign manager for a friend who was running for a political office. Haacke spent the next few years looking for opportunities to work and gain experiences, one of which was moving out to Tennessee with his brother and waiting tables. It was that decision that led Haacke to meet and later marry his wife. A father of four, Haacke spends his time doing various activities with his children, attending their athletic events and other school activities. This is a role he cherishes deeply. Nearly 20 years has passed since Haacke first entered the halls of Ricks College. A lifetime of decisions and opportunities has molded and shaped him into the teacher he is today. There is still a vision for the future in his eyes as he continues to embark on his quest for the Presentation Practice Center. A new office in the library may not seem like much to ordinary folk, but to Haacke it represents everything he has worked to achieve in his life.